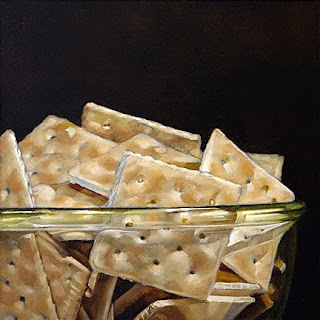 Karen has been suggesting for the longest time that I paint some saltine crackers, so I finally broke down, and gave them a try. Since I've been a glass mode lately, I decided to place them in a glass bowl. I really enjoy painting that thick rim on this particular bowl. It would be great if this subject proves to have more life to it, because it was fun to paint. If you'd like to place a bid on this painting, you can access the auction, by clicking here. During my last search for vintage appliances on ebay, I came across this Cory electric percolator. I was struck by its elegance, but it was that ribbed handle that cinched the deal for me. 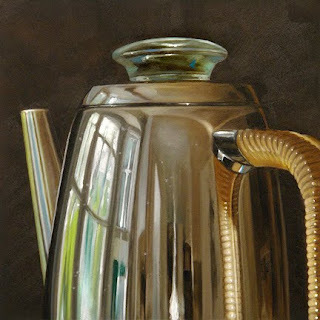 I have to admit the complexity of that handle increased the time it took to paint, but I think it was worth the effort. If you'd like to bid on this piece, you can access the auction by clicking here. In addition to participating in holiday festivities this past week, I've also been busy working on five new ebay paintings. I think it's a pretty good group. The first piece, is a blast from the past. 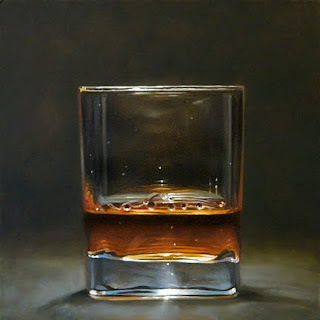 I've done a number of these "bourbon" paintings, and was in the mood to do one again. I'm not really a connoisseur of liquor, but I do love a shot of Wild Turkey from time to time. In addition to the ebay pieces, I've got a couple of larger paintings going as well. I'm courting my wife's gallery in Houston, and as soon as these two are complete I'll be sending them out to Dean Day Gallery, in hopes that they'll take me on. If you'd like to bid on this painting, you can take part in the auction by clicking here. Karen and I spent the evening with Jeff and Leslie Cohen for our annual cookie making Christmas eve. During our visit Jeff took me back to his studio/office to show me this video. Being a long time fan of Carl Sagan and Stephen Hawking, it bowled me over. It was created by John Boswell. John's states of his project (The Symphony of Science), "was designed to deliver scientific knowledge, and philosophy in musical form". His website, The Symphony of Science, has more songs, and links for anyone interested in science. The song is also available for download from iTunes. 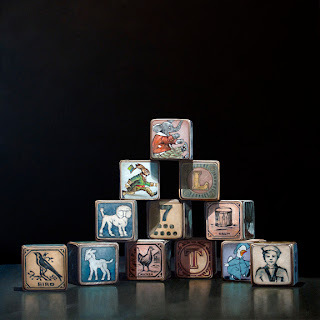 When Jeff at Stricoff Fine Art, and I talked about new paintings for his gallery, he expressed an interest in the blocks, so I was happy to oblige. We communicated recently, and he was glad to have this, and Place Setting (see Dec. 10th post) as well. I'm always a little nervous when I send images to galleries for approval, so it was a relief when he reacted so enthusiastically to these two paintings. There was also some discussion about sending these to the L. A. ArtShow in January. I'm not sure why I'm so excited at the thought of having my work in Los Angeles. Whatever the reason, I hope they make it there. One of my fondest televised recollections of Christmas, was this sixty second holiday greeting aired on CBS in the 6o's. It was such a poignant little animation, I was always surprised that it wasn't resurrected each year. Kudos to CBS at that time, for allotting a minute of airtime just to say "Seasons Greetings". I did a Google search, and found the video on YouTube. I wanted to post it here as my holiday greeting for 2009. For those of you who remember it, I hope it sparks happy memories, and for those who are seeing it for the first time, enjoy. Happy Holidays! 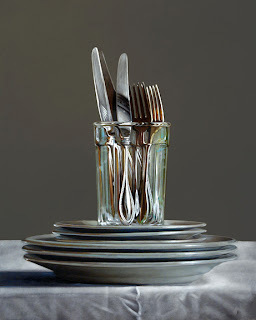 I finally finished "Place Setting". I think it turned out pretty good. I hadn't painted glass in a long time, and it was fun to get back to it. Now I'm onto the next piece to be offered to Stricoff Fine Art, Ltd. It's another set of blocks. They have been getting a lot of positive response, they're a treat to paint, so it was a logical choice. 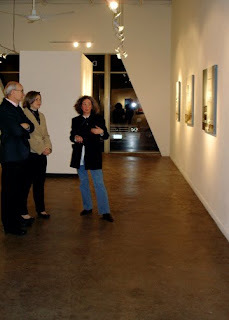 Karen and I headed out early Friday morning for Houston to attend the opening night reception of her show at Dean Day Gallery. As we dropped through the clouds into William P. Hobby Airport, we were greeted by the second great snow storm to hit Houston in the last ten years. Our drive from the airport to the hotel took place in nearly blizzard conditions. Karen had been working on her show for months, and it was a big decision to make the trip at all. Now it looked as though the whole thing could be a bust because of the weather. 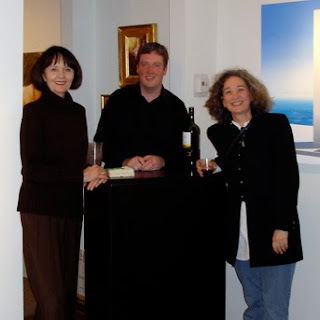 We drove over to the gallery around midday, then spent the better part of the afternoon getting acquainted with the owner Cathy Albright (above left). It was a really nice visit. Later that evening Cathy took us out to a wonderful restaurant for dinner, providing a satisfying end to what could have been a pretty bad day. By Saturday morning the front had completely moved through, and weather wise it was turning out to be a beautiful day. As tourists, the one thing we both wanted to do while we were there was visit the Houston Museum of Fine Arts. It's a great museum. If you ever find yourself in Houston, we highly recommend you add it to your list of must sees'. After the museum we returned to the hotel to relax, and get cleaned up for the reception. 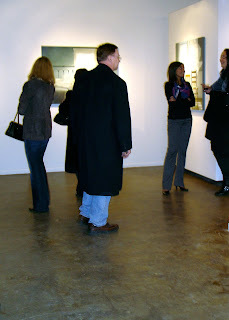 We headed over to the gallery a little before six, and people had already begun to arrive. By six thirty the place was packed. It was a terrific turn out. Karen was a little overwhelmed by the outpouring of affection for her, and her paintings. By the time they closed the doors she had met a lot of nice people, and sold four paintings. The kind of show we all hope for. To top off the night our Houston friends, and devoted collectors Lory Quist, and Judy Vandagriff along with their better halves Greg and Ross took us out to another amazing restaurant for dinner. These are four wonderful, and exceedingly generous people. It was a joy to spend time with them. For me, I had the added benefit of spending time with Greg Quist, and talking aviation. If you've read the bio on my website, you know that I've had a long time interest in flying. Greg's a senior captain with Southwest Airlines, who prior to that was a Navy fighter pilot. F-14's, and aircraft carriers. Very, very cool! 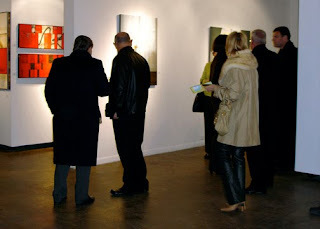 When we got back to the hotel I checked our email on my phone, and to add a final cherry to the top a very successful show, there was a message from Kelly at Mason Murer Gallery saying that she had sold another of Karen's paintings that afternoon. How great is that? We flew back to Atlanta early the next morning, and both agreed that it had been a wonderful trip. Karen and I would also like to thank Cathy at Dean Day, and Lory, Judy, Greg and Ross again for showing us such a great time. Thanks. As for me, I've been working on a painting for a little over a week now, which should be complete in the next day or so. This one, and a second that's ready to start, will be offered to Stricoff Fine Art. If I'm lucky, they'll be accepted, then sent to the L.A. Art Show in January.